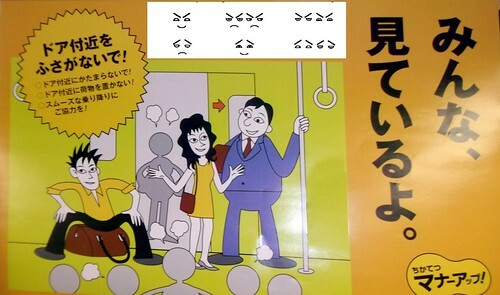 This Japanese subway train is encouraging passengers to mind their manners and not stand or sit in front of the doors, by telling that "Everyone is watching." The fear of being seen doing something ill-mannered is real and motivating to Japanese. Kitayama, Snibbe, Markus & Suzuki (2004) demonstrate that Japanese need only to be confronted with a poster showing various approving or disapproving gazes (inste top) to change their behaviour. The change observed in Kitayama's experiment was however, to become more self-enhancing, as measured by a spread of alternatives pre and post being given something. In front of the poster, Japanese (like Westerners with or without poster) became more inclined to up their rating of something that they now posses. The strange thing about this result is that the standard theory of Japanese manners is that Japanese should be self-deprocating rather than self-serving when in front of others. So why do the Japanese self-enhance (brag) in when made aware of an evaluating gaze?